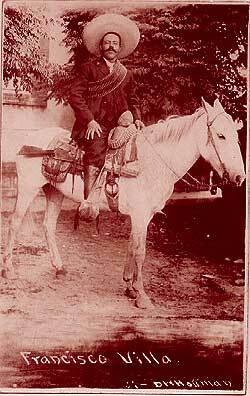 Pancho Villa was born Doroteo Arango in San Juan del Río, Durango, Mexico in 1877 (or in some sources, 1879). He spent much of his life in Durango, until, at age 16, he killed a man who had raped his younger sister. Little record exists of the next four or five years of his life, during which time he changed his name to Francisco Villa to evade the law. By the time he was 20, Villa had moved northward to Chihuahua, working on and off as a miner in Parral while selling stolen cattle in Chihuahua (official government biographies list his occupation then as "wholesale meat-seller"). In 1899 he returned to mining, this time in Santa Eulalia near Chihuahua, but he soon tired of the laborer's life and added bank robbery to cattle rustling and murder on the list of crimes for which he was wanted by the Díaz government. He established himself and his bandit followers in the sierras in 1900. Officially, the years 1900-09 are "unaccounted for," but it was during this period that he became a legendary hero to the poor for skillfully evading the Porfiriato's oppressive rurales police force. In 1910 Villa and his men came down from the hills to join Francisco I. Madero's revolutionary forces, thereby making a historical transition from bandidos to revolucionarios. The charismatic figure was able to recruit an army of thousands, including a substantial number of Americans, some of whom were made captains in the División del Norte. Villa even created one squadron made up entirely of Americans under the leadership of Capt. Tracey Richardson, a man who apparently fought with many different insurgent armies around the world at that time. Following Madero's short-lived victory and assassination, Villa remained in command of his División del Norte army in resistance--along with Coahuila's Venustiano Carranza and Sonora's Alvaro Obregón--against the 1913-14 Victoriano Huerta dictatorship. Around this time Villa also became something of a folk hero in the U.S, and Hollywood filmmakers as well as U.S. newspaper photographers flocked to Northern Mexico to record his battle exploits--many of which were staged for the benefit of the cameras. Villa's forces were based in Chihuahua, where Villa ruled over northern Mexico like a medieval warlord. Villa financed his army by stealing from the endless cattle herds in northern Mexico and selling beeves north of the border, where he found plenty of U.S. merchants willing to sell him guns and ammunition. Faced with a stagnant economy, he issued his own money; if merchants refused to take it, they risked being shot. Executions, which Villa often ordered on a whim, were usually left to his friend Rodolfo Fierro, best known by his nickname "El Carnicero" ("the Butcher"). In true Robin Hood style, he broke up the vast land holdings of local hacendados (hacienda owners) and parceled them out to the widows and orphans of his fallen soldiers. During fiestas the mustachioed legend would dance all night with female camp followers, although he didn't drink. When Emiliano Zapata insisted Villa join him in a toast when their two armies met outside Mexico City in December 1914, Villa gagged on a swig of brandy. He was an avid swimmer and would run to stay in shape. According to one of Villa's last surviving widows, he officially married 26 times. A split among the revolutionary leaders soon pitted Villa against Obregón and Carranza. When the U.S. government came out openly in support of the Carranza presidency, Villa retaliated by raiding U.S border towns, most notably Columbus, New Mexico. On the U.S. side of the border, Villa's image plummeted while many in Mexico saw Villa as an avenger of decades of "yanqui" oppression. Despite his popularity, the combined forces of Carranza and Obregón defeated the Villistas in one battle after another After two U.S. Army "punitive expeditions" into Mexico in 1916 and 1919 failed to route Villa, the Mexican government accepted his surrender and retired Villa on a general's salary to Canutillo, Durango. In 1923 he was assassinated while returning from bank business in Parral, Chihuahua. Today Villa is remembered with pride by most Mexicans for having led the most important military campaigns of the constitutionalist revolution, in which his troops were victorious as far south as Zacatecas and Mexico City, east as far as Tampico, and west as far as Casas Grandes. Because of Villa's Columbus escapade and subsequent evasion of U.S. troops, he is also often cited as the only foreign military personage ever to have "successfully" invaded continental U.S. territory. The Life and Times of Pancho Villa: Friedrich Katz's mammoth (1032 pp) definitive biography. The Wind That Swept Mexico : The History of the Mexican Revolution 1910-1942 : Anita Brenner and George R. Leighton. The Friends of Pancho Villa: James Carlos Blake's fictional account of the lives of Pancho Villa's troops.